Have Red Bull left it too late to catch Ferrari? While Lewis Hamilton placed a hand on the 2017 F1 world championship, Red Bull Racing’s double podium in Japan has left Ferrari looking over their shoulders once again at the team from Tilbrook. Five podiums in the last three races, including a win, from Max Verstappen and Daniel Ricciardo, compared to four non-scores, a fourth and a fifth place from the Scuderia have seen Red Bull dramatically close the gap to 92 points in the constructor’s championship. The stats make for uncomfortable reading for Sebastian Vettel and Kimi Raikkonen, but they only tell half the story. A double DNF in Singapore was the result of a poor decision from Vettel at the start, resulting in the elimination of both Ferraris and indeed Verstappen. But retirements in Malaysia (Raikkonen) and Japan (Vettel) were down to unreliability, and until Sunday’s race day, the red cars had looked the fastest in the last three races. Capitalising on bad luck for Ferrari coincides though with Red Bull’s resurgence since the summer break in almost a carbon copy of the 2016 campaign. Last year, Red Bull managed to overturn a margin to Ferrari after the summer break to claim second behind Mercedes. But despite the recent turnaround in fortunes, Red Bull may have left it too late to take second again. With a maximum of 215 points remaining, Red Bull must not only rely on heavily out-scoring on Ferrari, but also hope their recent unreliability is a regular occurance in the last five races. And it certainly played into their hands in Japan on Sunday as Verstappen and Ricciardo finished second and third respectively. Raikkonen was hit with a five-place grid penalty for changing his gearbox before the race leaving him to battle back through the pack, while Vettel’s car suffered problems on the grid, lasting just four laps before retiring. And though Verstappen kept race winner Hamilton in his sights throughout, the Dutchman never felt he was able to mount a challenge to the championship leader as he controlled the pace from the front. 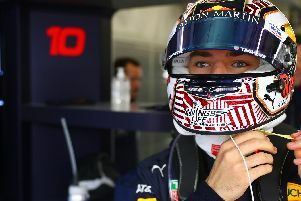 But with the 20-year-old’s renewed vigour, and Ricciardo’s podium consistency - nine in the last 12 - it might not be out of the realms for the team from Tilbrook to pile more pressure on the struggling Scuderia.